1. Prepare onions and red peppers; rinse the fresh leg of lamb. 2. 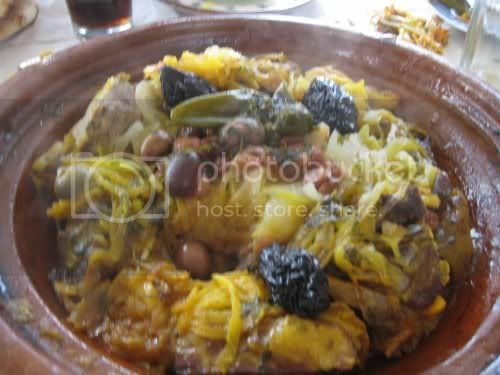 In a thick-bottomed pot (Moroccan tajine) arrange leg of lamb and add salt, peppers and onions cut into small pieces. For flavoring add ginger, saffron, olive oil, chopped garlic and parsley. Cover the pot with water. 4. After half hour of cooking: add carrots, potatoes, cumin, parsley, pepper and paprika. Also salt and water if needed. 5. After lamb and veggies are almost cooked add tomatoes, preserved lemon, olives. Reduce to lower temperature, taste the flavor, and serve once satisfied. Please note that water can be added at any time during the cooking period.